Many of us have received flowers for a special occasion like a birthday, a high school or college graduation or for a holiday like Valentine’s Day or Mother’s Day. Instead of just enjoying these flowers for a few days and throwing them away when they start to wilt, there is a way for you to preserve them. You can press your flowers so that you have a keepsake of a memorable event in your life. Fortunately, you don’t need a lot of know how or any special equipment to successfully press your flowers. Here’s what you need to know to press your flowers and have a keepsake that will last for years to come. Before you press your flowers, you need to choose which ones you will use, and prepare them. It’s important to choose flowers that are fresh and haven’t wilted yet in order to get the best results. If you can’t press them right way, that’s okay as you can place them in a sealable bag and put them in the refrigerator to use at a later time. Once you are ready to press your flowers, there are some things that you need to do. Remove any leaves from the stem that you don’t want to press. You can also remove the stem completely if you don’t want to use it as part of your pressed flower. If the flowers you are using don’t naturally have a flat face, you will need to cut them. This is common with certain flowers like roses and orchids. You can still use these flowers as all you need to do is use a pair of scissors to cut them down the middle. This is by far the easiest method to press flowers. To begin, first find the heaviest book that you have. Large dictionaries are good options. Just make sure you choose a book that you don’t mind damaging as moisture from the petals can damage the pages. After you’ve chosen a book, place a flower in between two pieces of printer paper. Then, place them in between two pages of the book. Close the book and place a few more books on top to ensure that enough pressure is placed on the flower. Every couple of days replace the printer paper. After about two weeks your flowers should be completely dry. Just remember that they will be very delicate so you will need to remove them with a pair of tweezers. If you don’t want to wait weeks for your flowers to dry you can use an iron to greatly speed up the process. You will first need to flatten the flowers. Just as with the book method, place the flowers in between two pieces of printer paper and place inside of a book and set aside. Next, remove any water that is in your iron and turn it on low and let it heat up. After it has heated up, remove the paper with the flowers in it from the book and place it on an ironing board. On the upper sheet of the printer paper, gently press the iron on the top of it for about 15 seconds. Remove the iron, wait about 15 seconds for the paper to cool and then repeat. After you have done this twice, lift off the top sheet of paper to inspect the flower. At this point they should be dried and feel stiff to the touch. If they don’t, repeat the process of ironing them. If you plan on pressing flowers often, you may want to invest in a few tools to do so. Wooden flower presses and microwave presses are available at many craft stores. However, both the book and iron methods produce very good results and crafters often find that they don’t need to invest in any items to yield beautiful pressed flowers. Glue them to a piece of paper and put them in a frame. Paint a canvas and add the pressed flowers to the wet paint. Make a decorative candle by glueing pressed flowers onto the outside of a plain one. Create a unique vase by attaching pressed flowers to the outside with mod podge. 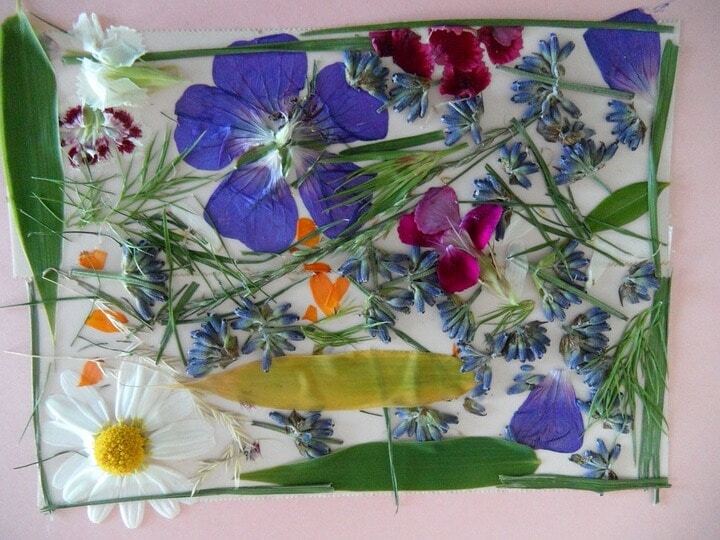 As you can see, there are all sorts of ways that you can use pressed flowers. The key to making them turn out great is to make sure that the flowers you choose aren’t starting to wilt and that they are as fresh as possible. By utilizing one of the methods listed above you can easily press your flowers and use them as part of project that you can display around your home or give them as a gift to others. How do you plan on using the flowers that you press?